A new peer-reviewed paper in Environmental Science and Technology suggests that methane emissions from natural gas power plants and oil refineries may be significantly higher than accounted for in current inventories. The report estimates average hourly methane emissions 11 to 90 times higher for refineries, and 21 to 120 times higher for natural gas power plants than those calculated from data provided by facility operators to Environmental Protection Agency’s Greenhouse Gas Reporting Program. 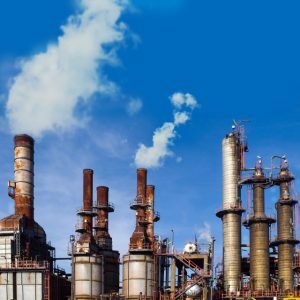 By multiplying total CO2 emitted annually by all US natural gas power plants and refineries (as tallied by EPA) by the methane-to-CO2 emission ratio determined in the study, the authors estimate yearly methane emissions from the nation’s refineries and gas-fired power plants are twenty times higher than currently reported. However, the results also show that gas-fired power plants still have lower greenhouse gas emissions than coal-fired power plants, even when accounting for these higher rates of methane emissions. Methane has especially high climate forcing effects in the short term. In weighing the climate benefits of natural gas over coal, it’s important to consider both the short term and long term climate impacts. This underscores the importance of reducing methane emissions to minimize the overall climate impact of using natural gas. Methane lost to the atmosphere is also a waste of a valuable energy resource. Researchers from Purdue University flew an airborne chemistry laboratory over the facilities to measure greenhouse emissions, using a mass balance technique to quantify methane and carbon dioxide emissions at three natural gas power plants and three refineries. Although the results are based on a relatively small number of samples and further measurements are needed to determine whether they are representative, the findings point to a need for more focus on leak detection and repair efforts. Most of the methane emissions were associated not with the CO2 plumes from the combustion stacks, but rather from other parts of the facilities (such as compressors, steam turbines, stream boilers and condensers), which indicates that natural gas is leaking before it is burned to generate power. The combustion stack sources, which the EPA GHG Inventory currently estimates to have only minor emissions, may actually contribute only about ten- to twenty percent of the total methane emissions from the facility. Reasons for the variation in hourly rates are not known, but there was a strong correlation between power plant operating capacity during the time of measurement (as indicated by hourly EPA Air Markets Program Data) and the methane and CO2 emissions rates measured in this study. What does this mean for natural gas? Natural gas has been touted as a cleaner replacement fuel for coal, and could play an important role in transitioning to a lower-carbon energy mix by facilitating higher rates of renewable energy deployment. Power plants currently use more than one third of natural gas consumed in the US and the volume used is expected to increase as market forces drive the replacement of coal with cheaper natural gas. But if natural gas is going to deliver on its promise, methane emissions due to leaks, venting, and flaring need to be kept to a minimum. Finding and fixing leaks from all points in the oil and gas value chain continue to offer the most bang for the buck in achieving this goal. While the findings are based on a small data set, they do show the potential for significant emissions not recognized in official inventories. Some additional natural gas power plant emission measurements are currently being made by the Purdue researchers who published this report. But more measurements will be needed to understand if the findings are representative of the industry profile. Those measurements and others would be greatly improved if done in collaboration with industry to correlate emissions with plant operations and possibly with onsite measurements. Along with the potential of higher emissions shown in this report, comes the potential to reduce waste from natural gas value chain and eliminate more of the dangers from methane pollution. EDF has coordinated a number of studies over the last few years with industry leaders resulting in the measurement of methane emissions from the natural gas supply chain from the well through gathering and processing to distribution. We invite leaders in the power and refinery sectors to collaborate with us and our partners to gather more data and innovate solutions. This entry was posted in Methane. Bookmark the permalink. Both comments and trackbacks are currently closed.